Full disclosure right up front — Karen and I went to school with the owners of Cherith Valley Gardens, Alan and Terri Werner. We were in band together, we spent hours at the golf and swim club Terri’s parents own, and Alan’s mom gave my siblings piano lessons. Terri’s creativity in the kitchen emerged early, because Karen remembers making salsa with her in high school! Alan ran a successful oil and gas drilling business until the late 1980’s, when the economy tanked. The Werners began gardening to feed their family, and they gifted friends and family with their homemade salsas and canned vegetables. Encouragement from those who loved their food and a small loan from a friend at church helped launch Cherith Valley Gardens. The family has developed a delicious line of salsas, jellies, pickled vegetables, “spirited” fruits, and gourmet stuffed olives. They maintain busy travel schedules promoting their products at gourmet and fancy food shows, and they wholesale their product to more than 2,500 specialty stores around the world. This is a classic example of a small artisan food business growing into a commercial success. While our love for the Werners’ products might not be completely unbiased, Cherith Valley Garden’s long list of awards validates their culinary talent! Check out their products on their website. 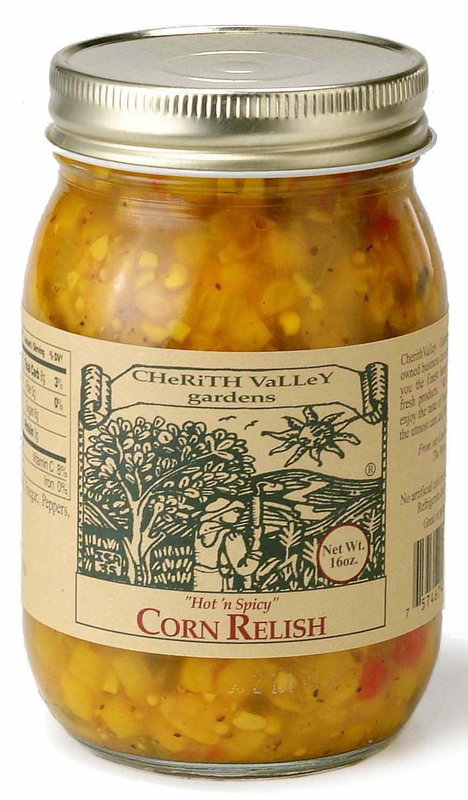 One of our favorite CVG products is Hot ‘n Spicy Corn Relish. This corn, onion, pepper and spice combination elevates the most humble tortilla chip to gourmet status, so yes, we eat it straight from the jar often. On a recent trip to Central Market, I noticed there was a demonstration for Hot ‘n Spicy Corn Relish, and they used it to make cornbread. Well, this really started the brain cells firing, because I had just made a jalapeno cornbread recipe that was a bit disappointing. The recipe called for creamed corn and a healthy measure of jalapeno peppers. I thought the creamed corn made the cornbread a little on the mushy side, and Allen thought it was too spicy. Plus, I made the recipe as written, and it didn’t call for sugar. Not good, since I really like sweet cornbread. On the plus side, the recipe called for the batter to be poured into a hot, oiled skillet, which made an excellent crispy crust. Could Hot ‘n Spicy Corn Relish take the recipe from mediocre to magnificent? Yes, it certainly could! After making a few recipe adjustments, we had a winner. The cornbread retained the crisp crust we had originally enjoyed. The sugar in the relish toned down the heat from the jalapenos, and the whole kernel corn in the relish banished the mushy creamed corn texture. Although you could bake this cornbread in a shallow, 2-quart ovenproof dish, I recommend a cast-iron skillet for the best results. I found Hot ‘n Spicy Corn Relish on Amazon if you can’t find it in a store near you. Preheat oven to 400 degrees. Pour the oil into the baking dish or skillet, and heat in the oven until very hot. While the baking dish is heating, combine the cornmeal, salt, baking soda and 1/2 the grated cheese in a medium bowl. In a separate bowl, mix the milk, eggs, and CVG Hot ‘n Spicy Corn Relish. Add the liquid ingredients all at once to the dry ingredients, and mix well. Remove hot baking dish from the oven. Using a paper towel, carefully rub a little of the hot oil on the sides of the dish. Do not let the paper towel absorb much of the oil. 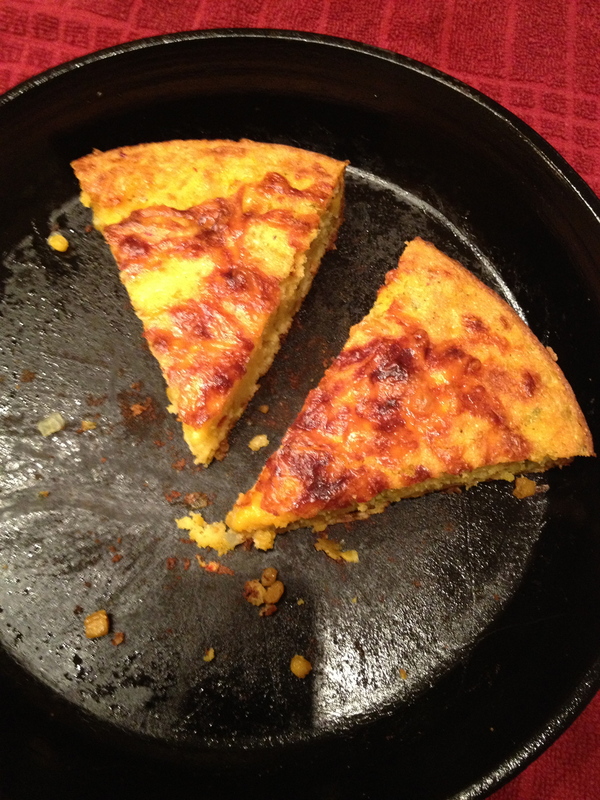 Pour the cornbread batter into the hot skillet and sprinkle remaining cheddar cheese on top. Bake for 30 minutes.